Bring beauty and color to your dining room with Stained Glass Inc. windows and lighting. Transform your dining area through the addition of stained glass. Gently filter the sun with a one-of-a-kind stained glass masterpiece that will radiate beauty and warmth throughout the entire room. Stained glass can quickly and easily be incorporated into your dining area in a variety of ways. If you want to light up your kitchen table with illuminated stained glass, consider hanging a dome light fixture directly over the table. This unique way of lighting will add a fun, yet tasteful splash of color while evoking feelings of comfort and relaxation. Stained glass windows are great additions to any residential dining area. Incorporate single or multiple stained glass inserts to utilize natural sunlight without the risk of unwanted glares. These beautiful windows will add splendor and color to your dining area while simultaneously filtering the bright sunshine and blocking unattractive views. 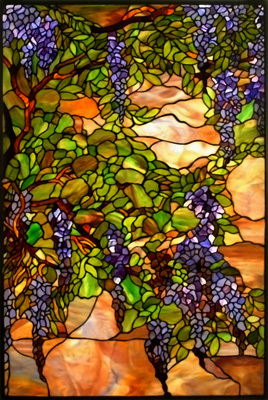 Stained Glass Inc. boasts the world's largest collection of stained glass designs to choose from. If you still can't find what you are looking for, our talented team of designers can create something completely custom. Our designs can match any size, any shape, or any color you desire. If you don't see exactly what you need, call or email to speak with one of our stained glass design specialists. The consultation is free.